Magnificent old water mill that has been restored and renovated from top to bottom. 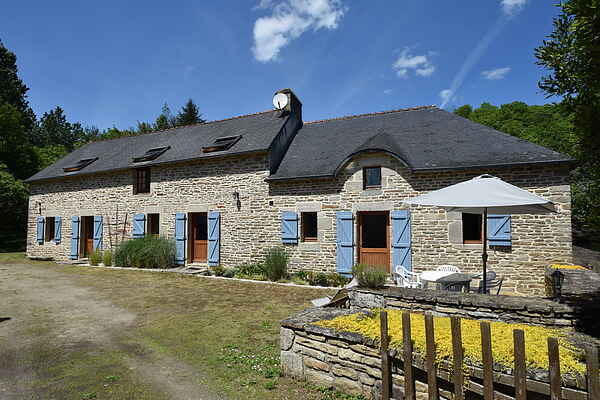 Roomy holiday home with enormous rooms, surrounded by a magnificent green estate (5 ha) with woods, fields, orchards, countless hydrangeas and a babbling brook that borders the entire property. In Bannalec (2 km) (shops, restaurants, tennis and Internet access at the office du tourisme) you can swim and enjoy sunbathing as well as rent a surfboard or a sailing-boat or perhaps enjoy a long walk on the beach. For bicycle hire and a fishing lake you can go to Rosporden (8 km) At picturesque Quimperlé (15 km) you can go canoeing on the Isole river. Pont Aven (10 km) has a swimming pool. Just a fifteen minute drive takes you to the beach (Kerleven) at medieval Concarneau (20 km) which has a walled island in the harbour. Port Manech also has a lovely small beach (25 km). Further afield there is Quimper which is a city of considerable size. The old centre harbours a Gothic cathedral, beautiful craftsman houses and numerous art museums.